Latest issue consulted: Vol. 91, no. 182 (June 30, 2000). County meetings I agree with the comment about wanting a way to communicate with the county c ommission during the meetings that are online. Sometimes I am sitting at home watching a meeting and I have some information t o contribute to the discussion. Sometimes I know the answer to a question they are asking, or I know some past history and details t hat some sitting on the board dont seem to know. I can write or call them after the meeting, but it would be so much better if I could get that information to them at the meeting. How about email? Set up a special email address for the meeting and maybe have s omeone check for messages periodically or at the breaks and read them into the record? T hey would have the email address of the s ender, so it would be identi ed. Or maybe t hey could set up a Skype account and let people call in. There is so much technology available. There must be a way to let people participate when they cant physically get to t hat meeting.  It seems to me that the county commission is basing their decision to hold meeting during the day on past history. When they held meetings at night, they didnt get many people attending, unless it was a hot button item, For example, when they discussed the re tax, the meetings were packed. I think they should be more exible and offer night meetings when the public shows enough interest. One reason they dont hold all of the meetings in the evening is that they have to pay some staffers, such as the clerks of ce personnel who record the meetings, extra if the meeting is after 5 p.m. Holding the meetings during the regular work day saves the county money. Credit card fraud With all of the stories in the news about credit card fraud, I think I may start carrying cash again and paying bills by mail with checks. It seems like it might be safer in the long run. If someone robs you, they might get the cash you have with you but at least they cant wipe out your bank account and steal your identity!  I wrote check ID on my credit cards to provide another level of security, but it does little good. Nine times out of ten when use my card, they dont ask for ID. The clerks dont look very carefully at credit cards. That is probably one reason there is so much fraud. It is easy for the bad guys to use stolen cards because the clerks arent going to ask for ID. The love of GodBy Mark MayersLMFT, CAP of Real Life Childrens Ranch The love of God is incredibly hard for our human hearts and minds to understand. It is so much deeper than our human love. Paul tells us in Ephesians 3:14-19 that we are to be rooted and established in His love. 14 For this reason I kneel before the Father, 15 from whom every family in heaven and on earth derives its name. 16 I pray that out of His glorious riches He may strengthen you with power through His Spirit in your inner being, 17 so that Christ may dwell in your hearts through faith. And I pray that you, being rooted and established in love, 18 may have power, together with all the Lords holy people, to grasp how wide and long and high and deep is the love of Christ, 19 and to know this love that surpasses knowledge that you may be lled to the measure of all the fullness of God. Humanly we cannot understand or grasp how deep the love of God is. God tells us in these verses that it takes the power of God to understand the love of God. When we are able by Gods love to grasp the depth of His love it lls us up with the fullness of God. What an incredible gift to have in this world. In an empty world with so many empty people God promises that we can be lled with His fullness. I am convinced that many o f the emotional problems we face come from the emptiness of rejection and failure. W e are constantly seeking the approval and affections of others to ll the emptiness of ou r souls. The fullness that comes from knowing that the God of the universe loves and forgives us is critical for our success. One of the most amazing things abou t Gods love is that He loves us in the mids t of our sins. Romans 5:6-8 says 6 For whil e we were still helpless, at the right time Chris t died for the ungodly. 7 For one will hardl y die for a righteous man; though perhaps fo r the good man someone would dare even to die. 8 But God demonstrates His own lov e toward us, in that while we were yet sinners, Christ died for us. May we take comfort in the incredible truth that in the midst of ou r expansive universe, that the God of heaven and earth reached out to save us while w e were unlovable. December 27, 2013 4 Okeechobee News OPINION Public Forum/Speak Out Re ections from the pulpit Letters to the editor To Reach UsAddress: 107 S.W. 17th Street, Suite D Okeechobee, FL34974 Website: www.newszap.comTo Submit NewsThe Okeechobee News welcomes submissions from its readers. Opinions, calendar items, stories ideas and photographs are welcome. Call (863) 763-3134 to reach our newsroom. Items may be mailed, faxed or e-mailed. E-Mail: okeenews@newszap.com Speakout: (863) 467-2033To Place A Display AdPhone: 863-763-3134 E-Mail: okeeadsales@newszap.comTo Place A Classified AdCall 877-353-2424 to place a classified advertisement from home. Fax: 877-354-2424 E-Mail: classads@newszap.comBilling DepartmentE-Mail: billteam@newszap.comTo Start or Stop A PaperPhone: (800) 282-8586 E-mail: readerservices@newszap.com The Okeechobee News is available three times a week via home delivery and is on sale at rack and store locations throughout Okeechobee County. Call the office to find out if your home is within our present home-distribution boundaries. Call 800-282-8586 to report a missed newspaper or poor delivery. Additional copies of the newspaper are available for 50 cents Wednesday and Friday and 75 cents for Sunday at the office. Home delivery subscriptions are available at $18.00 for three months. 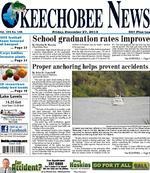 Okeechobee News USPS 406-160 Published Sunday, Wednesday and Friday by Independent Newspapers, Inc. 107 S.W. 17th Street, Suite D  Okeechobee, FL34974 Periodicals Postage Paid at Okeechobee, FL34974 POSTMASTER: Send address changes to Okeechobee News Circulation Administration PO Box 7011  Dover, DE 19903StaffAdvertising Director: Judy Kasten News Editor: Katrina Elsken Circulation Manager: Janet Madray Chairman: Joe Smyth President: Ed Dulin Vice President of Newspaper Operations: Tom Byrd Executive Editor: Katrina ElskenOur PurposeThe Okeechobee News is published by Independent Newspapers of Florida. Independent is owned by a unique trust that enables this newspaper to pursue a mission of journalistic service to the citizens of the community. Since no dividends are paid, the company is able to thrive on profit margins below industry standards. All after-tax surpluses are reinvested in Independents mission of journalistic service, commitment to the ideals of the First Amendment of the U.S. Constitution, and support of the communitys deliberation of public issues.We PledgeTo operate this newspaper as a public trust To help our community become a better place to live and work, through our dedication to conscientious journalism. To provide the information citizens need to make their own intelligent decisions about public issues. To report the news with honesty, accuracy, purposeful neutrality, fairness, objectivity, fearlessness and compassion. To use our opinion pages to facilitate community debate, not to dominate it with our own opinions. To disclose our own conflicts of interest or potential conflicts to our readers. To correct our errors and to give each correction the prominence it deserves. To provide a right to reply to those we write about. To treat people with courtesy, respect and compassion. MEMBER OF: Speak Out has moved online, where i t is quicker and easier to share your i deas and converse with others. Go to w ww.newszap.com, click on the comm unity name and your local or state P ublic Forum. There, you can create n ew topics or comment on existing t opics. What follows is a sam pling of s ome of the discussions currently taki ng place. Thanks for participating! W hy go smoke-free?Do you own rental property? Are you interested in a policy that can help you save time and money, increase occupancy and even improve the health of your tenants? Affordable and popular smoke-free housing is gaining traction. Join the movement! Smoke-free housing saves time and money:  At the end of the lease, smoke-free units require less turnover time due to fewer cleaning and repair needs.  Smoke-free policies can eliminate the need to repair or replace infrastructure damaged by cigarette burns or nicotine stains. Tenants want smoke-free housing:  In one survey of 421 managers of smoke-free properties in Florida, 99.5 percent agreed that a smoke-free policy did not hurt occupancy and 30.1 percent believed that the policy increased occupancy.  There are more than 500 smoke-free housing properties and 73,000 smoke-free units in Florida.  More than 80 percent of adults in Florida are non-smokers and the fast majority of tenants  four out of ve  would prefer to live in smoke-free housing. For more, see tobaccofree orida.com/ smokefreehousing. The Tobacco Free Partnership of OkeechobeeYatchette Club hosts 30th annual boat paradeThe Okeechobee Yatchette Club Christmas boat parade was a huge success again this year. We would like to thank our Sheriffs dept for leading it, all the folks that decorated their boats and participated in it, the hundreds of folks that came to see it, the VFW post 10539 for hosting the welcome party after the parade and the Okeechobee News WOKC radio and all the folks that helped us advertise it. We would like to wish everyone a very Merry Christmas and a Happy New Year from all the members of The Okeechobee Yatchette Club. Our next project will be a comedy sho w on Jan. 18, at Good Spirits Lounge to raise money for our scholarship fund and our canned goods and supplies needed by our senior citizens that are not as fortunate as some. Tickets can be purchased at Good Spirits lounge or call Bette at 863-610-0749 or Ellen at 863-824-0681. Thank you, Arnold Whelpley Okeechobee Yatchette Club Agri-Civic Center open to public for exercising Unless an event is taking place, the Okeechobee County Agri-Civic Center grounds are open to area residents for exercise activities such as walking, running, and bike riding on a daily basis. The gate on State Road 70 is open from 7 a.m. until dusk for residents to access the roads and parking lots within the facility. The staff asks everyone to help keep the facility clean by not littering. 2 Serving the communities south of Lake Okeechobee May 27, 2010 772.461.6000 TOLL FREE 877-251-FORD (3673) SOME VEHICLE PHOTOS ARE APPROXIMATE LIKENESS TO THE IN STOCK INVENTORY. *0% APR for 60 months through Ford Motor Credit WAC plus tax, tag title and $289 dealer fee. PRICES MAY REQUIRE TRADE ASSIST AND INCLUDE ALL REBATES PLUS TAX, TAG, TITLE AND $289 DEALER FEE. New vehicles priced accurately at time advertisement on press. Pre-owned info is based on $2,000 down, 66 months with approved credit.YOUR INTERNET REPRESENTATIVE MARK GALLAGHER MON. 2 Serving the communities south of Lake Okeechobee May 27, 2010 ORTHOPAEDICS Dr. Benjamin Epstein Dr. Epstein is an experienced orthopaedic surgeon, who has been in practice for 20 years. Dr. Epstein is Board Certied by the American Osteopathic Academy of Orthopedics. Great Orthopaedic CareRight Here in OkeechobeeOrthopaedic Specialists at Raulerson is located at 1924 Hwy 441 North, Okeechobee (just north of the Hospital, in the blue-roof building) Call for an appointment 863-357-0540. We Treat Kids Too! For more information or to schedule an appointment, call 863-357-0540 .Orthopaedic Specialists at Raulerson offers a full range of orthopaedic services including:  Total Hip and Knee Replacements  Arthroscopic Surgery & Sports Medicine  Pediatric Orthopedics  Work Related injuries Most insurances and Medicare are accepted. Big Lake Cancer CenterSupports e Ride for the FightJanuary 1, 2014  Okeechobee Cattlemans Arena For more information, call 863.634.3971 Please join us for Heroes for Hope Cancer Support Group For more information, call 863.467.9500 1115 North Parrott Avenue, Okeechobee RADIATION ONCOLOGISTS Our business directory product provides the necessary tools to showcase your business successfully and generate more revenue for you! For more information, contact 863.763.3134 or email  bizsearch@newszap.com 10 Okeechobee News December 27, 2013 GAINESVILLE  University of Floridas Institute of Food and Agricultural Sciences faculty work on just about any food-related topic imaginable. As 2014 approaches, here are just a few of their food-related predictions  everything from better fruit packaging to a new focus on reducing food waste  that may soon be on the publics radar. Good taste, less waste: Food researchers say roughly one-third of food produced for humans around the globe is lost or wasted each year  1.3 billion tons of it. Discussion of this problem is expected to make its way from food industry and academic circles and into A merican homes, with home food preparers becoming more sensitive to reducing food waste. Fresher fruit: Jeff Brecht works on w ays to improve fruit avor and consumer experience. To that end, hes w orked with UF and University of California, Davis researchers on modi ed atmosphere packaging for a range of fruits, including berries and tomatoes. In that packaging, special polymers interact with fruit respiration so that oxygen is decreased while carbon dioxide is increased. The result? Handlers can wait longer to pick fruit; it takes longer to go bad. And tropical and subtropical fruits can be held at higher temperatures to avoid avor-robbing chilling injury. Better-tasting, home-grown tomatoes: Harry Klee, UFs tomato-taste tinkerer, has worked for years to target the most universally consumer-pleasing tomato avors. He and colleagues are poised this year to release two hybrid tomatoes, suitable for non-commercial growers, and both are said to knock it out of the park in taste tests. Garlic: Sue Percival, chairman of IFAS Food Science and Human Nutrition department, and colleagues found modest changes in the immune responses of human subjects who consumed an aged garlic extract every day, as part of a six-month research study. A control group took placebos. Both groups kept health diaries and gave blood samples. The garlic didnt prevent colds or u, she said, but researchers did nd that cold and u symptoms were reduced between 30 and 50 percent. Eat your broccoli: Consumers will begin to focus more on vegetable consumption, both for better health and to lessen their environmental footprint. Demand may outpace supply, and while Food Safety Modernization Act requirements will help ensure safer produce, it will undoubtedly boost costs for growers, packers and grocers  and consumers. And eat your mushrooms: In a more recent study, Percivals team tested shiitake mushrooms effect on human health outcomes. One group ate a daily serving of chopped, dried mushrooms; a second group ate two servings. Blood was taken from both groups at the start and end of the study. Both groups test results revealed remarkable bene cial changes in their immune-system regulating cytokines and immune function, she said. Experts see food trends that may end up on your plate in 2014 Special to the Okeechobee News/ UF/IFAS Tyler L. JonesResearchers at the University of Florida study how food trends will affect consumers. 2 Serving the communities south of Lake Okeechobee May 27, 2010 William S. Bill HaysFeb. 1, 1941  Dec. 28, 2009 Fishermans Prayer God grant that I may live to sh Until my dying day And when it comes to my last cast I then most humbly pray When in the Lords safe landing net Im peacefully asleep at in His mercy I be judged As big enough to keepAuthor UnknownFish on, my love miss miss you We never promised forever, but always! Charlie Hays Any man can be a father, but it takes a special man to be a dad! And thats what you are! You were always there for me, no matter what! I am so lucky to have you as my dad  you are the best dad a daughter could ever ask for! ank you for being my dad! I miss you so much! I love you, Dad! Love, Jody 11 Okeechobee News December 27, 2013 Special to the Okeechobee News/ YMSYMS Students of the weekYearling Middle School is pleased to announce students of the week for Dec. 9: Shalee Underhill, Maci Wesemen, Brandon Perez, Timothy Nettles, Riley Kirksey and Elexis Villapando. Special to the Okeechobee News/ EESEverglades Employee of the YearEverglades Elementary School is pleased to announce Crystal Flynn (left), a clerical aide, has been named School Related Employee of the Year this 2013-14 school year. Congratulations, Crystal, and thank you for all you do! At right is Leslie Lundy, principal. Special to the Okeechobee News/ SESSouth Elementary Students of the WeekCongratulations to the Students of the Week at South Elementary School for the week of Dec. 16-20. They are: LaQuiria Ulysse, Eduardo Alavez Bocardo, Roxana Torres, Noah Hamblen, Izzy McQueen, Zavier Garcia, Lexi Lorenz, Bryan Marquez, Justin Gatliff, Alyssa Nelson, Zane McLaughlin, Jessica Rodriguez Lopez, Tristan Sweat, McKenzie Powers, Kayli Guerrero, Alexis Mundell and Chelsea Hastings. 2 Serving the communities south of Lake Okeechobee May 27, 2010 12 Okeechobee News December 27, 2013 Special to the Okeechobee News In an ongoing commitment for over 85 y ears to provide services and products that deliver convenience, control and security for its customers, Seacoast National Bank has added new and enhanced digital services to their existing digital applications, including Digital Depositthe ability to deposit a check by taking either a picture or scan and transmitting the image to the bank. Digital Deposit is now available to both business and consumer accounts. And while Seacoast consumer accounts have enjoyed apps for Android, iPhones and iPads for some time, these mobile banking services are now available to business accounts as well, enhancing the existing capabilities for those who prefer digital banking. Seacoast has made this investment to provide a customer experience that uniquely combines the technology of a larger institution with the service levels of a communityfocused organization, said Chuck Shaffer, Seacoasts Retail Banking Executive. We believe this combination makes Seacoast a unique banking choice for our customers. Seacoast is committed to giving our customers the ability to manage their nancial lives conveniently and our expanded digital services support that need for convenience, added Shaffer. While digital services and the convenience they provide are clearly important, our aim is to provide the convenience and personal service our customers have come to expect when navigating the complexities of managing ones nancial life.  Mobile Banking apps are now available to business accounts, as well as Premium Alerts, which allow business customers to receive alerts via text message. And while these services have long been available to our consumer accounts, there are new enhancements for consumers as well, including transfers between your Seacoast account and your account at another banking institution and the ability to customize your online experience through the new nancial center dashboard. Since the launch of Mobile Banking for consumers more than two years ago, we have seen a tremendous increase in usage with our customers logging into their accounts via a mobile device on the average 50 times each month, continued Shaffer. These new services complement the existing digital services Seacoast offers, such as online banking, e-statements and online bill pay. The enhancements also support the everyday conveniences, nancial advice and friendly service we provide to folks in our communities and re ect our committed to you, our customer, and to our community. Weve been doing business this way since 1926. Seacoast offers expanded digital services Special to the Okeechobee NewsSouth Elementary honors Teacher and Employee of the YearCongratulations to Carrie Heinen (photo at left) for being selected as Teacher of the Year at South Elementary for the 2013-14 school year. Congratulation to Tami Higgins, School Related Employee of the Year at South Elementary for the 2013-14 school year. Also pictured in principal M ike Radebaugh. (photo at right) Special to the Okeechobee News/ OMSOMS honors Teacher and Employee of the YearOsceola Middle School is proud to present Teacher of the Year Christine Finch (photo above left) and School Related Employee of the Year Mayra Talavera (photo above right)! Also pictured is Principal Sean Downing. Congratulations to these wonderful ladies! Happy and Delicious New Year!Enjoying black-eyed peas and rice for luck in the coming year is a tradition passed down through generations. When making your plans to ring in the New Year, youll  nd everything you need to prepare the dishes that have a special meaning to you, your family, and community at Publix. 14 Okeechobee News December 27, 2013 Special to the Okeechobee NewsGospel sing plannedGospel singers Gold City and the McKameys (pictured here) will perform on Friday, Jan. 10, at the KOA Convention Center in Okeechobee at 7 p.m. No tickets are required for this special concert. A $10 donation per person will be requested at the door for the concert. A free-will offering will be received during the concert for FCC Ministries. Doors open at 6 p.m. and all seating is general admission. The KOA Convention Center is located at 4276 U.S. Hwy. 441 South in Okeechobee. For more information, call 863-763-0231. Special to the Okeechobee News Indian River State College Criminal Justice students collected hundreds of Stockings to Soldiers donations for several weeks to help support the active military serving abroad during the holidays. The students placed collection boxes at several locations throughout South Florida and were entirely responsible for collecting and organizing the items. The students also made their own generous contributions. With the help of monetary donations, the Stockings to Soldiers items were shipped in time for the holidays. IRSC students provide Stockings to Soldiers Special to the Okeechobee NewsIRSC Criminal Justice students collected hundreds of donations for soldiers for several weeks. Public Notice Public Notice Public NoticeNOTICE OF APPLICATION FOR TAX DEED 2014TD044 NOTICE IS HEREBY GIVEN, that OKEECHOBEE UTILITY AUTHORITY the holder of the following certi cate has led said certi cates for a tax deed to be issued thereon. The certi cate number and year of issuance, the description of the property, and the names in which it was assessed are as follows: Certi cate No: 3604 Year of Issuance: June-01-2011 Description of Property: ALL THAT PART OF THE FOLLOWING DESCRIBED PROPERTY LYING IN SECTION 05 TOWNSHIP 38 SOUTH RANGE 36 EAST A PARCEL OF LAND LYING IN SECTION 31 TOWNSHIP 37 SOUTH RANGE 36 EAST AND SECTIONS 5 AND 6 TOWNSHIP 38 SOUTH RANGE 36 EAST OKEECHOBEE COUNTY FLORIDA SAID LAND ALSO LIES WITHIN A PORTION OF BLOCK 3 FARM LANDS OF THE CONSOLIDATED LAND COMPANY ACCORDING TO THE PLAT THEREOF RECORDED IN PLAT BOOK 1 PAGE 5 PUBLIC RECORDS OF OKEECHOBEE COUNTY FLORIDA AND A PORTION OF BLOCK 3 GREAT LAKE SUBDIVISION ACCORDING TO THE PLAT THEREOF RECORDED IN PLAT BOOK 1 PAGES 36 THROUGH 45 INCLUSIVE OF THE PUBLIC RECORDS OF OKEECHOBEE COUNTY FLORIDA AND IS MORE PARTICULARY DESCRIBED AS FOLLOWS COMMENCING AT THE SOUTHWEST CORNER OF LOT 3 BLOCK 3 SAID GREAT LAKE SUBDIVISION THENCE S 55 DEG 36 MIN 37 SEC E ALONG THE NORTHERLY RIGHT OF WAY RW LINE OF STATE ROAD 15 WIDTH VARIES A DISTANCE OF 400.16 FEET THENCE CONTINUE ALONG SAID RW LINE S 58 DEG 36 MIN 43 SEC E A DISTANCE OF 144.49 FEET TO THE POINT OF BEGINNING THENCE DEPARTING SAID NORTHERLY RW LINE RUN N 31 DEG 23 MIN 17 SEC E PERPENDICULAR TO THE PRECEDING COURSE A DISTANCE OF 2140.56 FEET THENCE S 59 DEG 40 MIN 11 SEC E A DISTANCE OF 2206.93 FEET TO THE EASTERLY LINE OF A 30 FEET WIDE STRIP OF LAND AS SHOWN ON THE AMENDED PLAT OWNERSHIP OF RE HAMRICK AND ANNIE B HAMRICK ACCORDING TO THE PLAT THEREOF RECORDED IN PLAT BOOK 3 PAGE 58 OF THE PUBLIC RECORDS OF OKEECHOBEE COUNTY FLORIDA THENCE S 30 DEG 19 MIN 49 SEC W ALONG SAID EASTERLY LINE A DISTANCE OF 1220.61 FEET THENCE S 67 DEG 47 MIN 29 SEC W ALONG THE EASTERLY LINE OF SAID 30 FEET WIDE STRIP OF LAND A DISTANCE OF 1164.45 FEET TO THE INTERSECTION WITH THE ARC OF A NON TANGENT CURVE IN THE AFORESAID NORTHERLY RW LINE OF STATE ROAD 15 SAID CURVE BEING CONCAVE TO THE NORTHEAST HAVING A RADIUS OF 17138.74 FEET A CENTRAL ANGLE OF 00 DEG 56 MIN 41 SEC AND BEING REFERENCED BY A CHORD BEARING OF N 59 DEG 44 MIN 19 SEC W AND CHORD DISTANCE OF 282.57 FEET THENCE NORTHWESTERLY ALONG THE ARC OF SAID CURVE A DISTANCE OF 282.58 FEET TO THE SOUTHWESTERLY CORNER OF LOT 22 AFORESAID BLOCK 3 GREAT LAKE SUBDIVISION THENCE DEPARTING SAID NORTHERLY RW LINE RUN N 31 DEG 23 MIN 17 SEC E ALONG THE WEST LINE OF SAID LOT 22 A DISTANCE OF 131.87 FEET THENCE DEPARTING SAID EAST LINE RUN N 58 DEG 36 MIN 43 SEC W A DISTANCE OF 200.00 FEET TO THE INTERSECTION WITH THE WEST LINE OF LOT 20 ALSO BEING THE EAST LINE OF LOT 19 SAID BLOCK 3 GREAT LAKE SUBDIVISION THENCE S 31 DEG 23 MIN 17 SEC W ALONG SAID WEST LINE OF LOT 20 BLOCK 3 A DISTANCE OF 150.00 FEET TO THE SOUTHWESTERLY CORNER OF SAID LOT 20 BLOCK 3 BEING A POINT ON THE AFORESAID NORTHERLY RW LINE OF STATE ROAD 15 THENCE N 58 DEG 36 MIN 43 SEC W ALONG SAID NORTHERLY RW LINE A DISTANCE OF 400.00 FEET TO THE SOUTHWESTERLY CORNER OF LOT 16 SAID BLOCK 3 GREAT LAKE SUBDIVISION THENCE N 58 DEG 36 MIN 43 SEC W CONTINUING ALONG SAID NORTHERLY RW LINE OF STATE ROAD 15 A DISTANCE OF 655.51 FEET TO THE POINT OF BEGINNING 1.89 ACRES 05 38S 36E 1-05-38-36-0A00-00001-F000 Said property being in the County of Okeechobee, State of Florida Name in which assessed: DANIEL A SCHAURER DANIEL D EASTMAN FRA MAR ENTERPRISES INC LAND VENTURES OF AMERICA LLC MICHAEL J LOCIGNO RICHARD EVANS Unless said certi cate shall be redeemed accor ding to law the property described in such certi cate shall be sold to the highest bidder at the Okeechobee County Judicial Center, Jury Assembly Room, 312 NW 3rd Street, Okeechobee, Florida 10:00 A.M., on the 23rd day of January, 2014. SUBJECT TO CURRENT TAXES SHARON ROBERTSON, CLERK OF CIRCUIT COURT Okeechobee County, Florida /s/ Robin R. Parrish Deputy Clerk NOTICE REGARDING THE AMERICANS WITH DISABILITIES ACT OF 1990; In accordance with the Americans With Disabilities Act, persons needing a special accommodation to participate in this proceeding should contact Court Administration no later that seven days prior to the proceeding at 250 NW Country Club Drive, Port St. Lucie, Florida 34986, 1.772.807.4370 within two working days of your receipt of this notice. IF YOU ARE HEARING IMPAIRED CALL 1.800.955.8771; IF YOU ARE VOICE IMPAIRED CALL 1.800.955.8770. 456290 ON 12/13,20,27/2013 1/3/2014 Public NoticeNOTICE OF APPLICATION FOR TAX DEED 2014TD045 NOTICE IS HEREBY GIVEN, that OKEECHOBEE UTILITY AUTHORITY the holder of the following certi cate has led said certi cates for a tax deed to be issued thereon. The certi cate number and year of issuance, the description of the property, and the names in which it was assessed are as follows: Certi cate No: 3625 Year of Issuance: June-01-2011 Description of Property: ALL THAT PART OF THE FOLLOWING DESCRIBED PROPERTY LYING IN SECTION 06 TOWNSHIP 38 SOUTH RANGE 36 EAST A PARCEL OF LAND LYING IN SECTION 31 TOWNSHIP 37 SOUTH RANGE 36 EAST AND SECTIONS 5 AND 6 TOWNSHIP 38 SOUTH RANGE 36 EAST OKEECHOBEE COUNTY FLORIDA SAID LAND ALSO LIES WITHIN A PORTION OF BLOCK 3 FARM LANDS OF THE CONSOLIDATED LAND COMPANY ACCORDING TO THE PLAT THEREOF RECORDED IN PLAT BOOK 1 PAGE 5 PUBLIC RECORDS OF OKEECHOBEE COUNTY FLORIDA AND A PORTION OF BLOCK 3 GREAT LAKE SUBDIVISION ACCORDING TO THE PLAT THEREOF RECORDED IN PLAT BOOK 1 PAGES 36 THROUGH 45 INCLUSIVE OF THE PUBLIC RECORDS OF OKEECHOBEE COUNTY FLORIDA AND IS MORE PARTICULARY DESCRIBED AS FOLLOWS COMMENCING AT THE SOUTHWEST CORNER OF LOT 3 BLOCK 3 SAID GREAT LAKE SUBDIVISION THENCE S 55 DEG 36 MIN 37 SEC E ALONG THE NORTHERLY RIGHT OF WAY RW LINE OF STATE ROAD 15 WIDTH VARIES A DISTANCE OF 400.16 FEET THENCE CONTINUE ALONG SAID RW LINE S 58 DEG 36 MIN 43 SEC E A DISTANCE OF 144.49 FEET TO THE POINT OF BEGINNING THENCE DEPARTING SAID NORTHERLY RW LINE RUN N 31 DEG 23 MIN 17 SEC E PERPENDICULAR TO THE PRECEDING COURSE A DISTANCE OF 2140.56 FEET THENCE S 59 DEG 40 MIN 11 SEC E A DISTANCE OF 2206.93 FEET TO THE EASTERLY LINE OF A 30 FEET WIDE STRIP OF LAND AS SHOWN ON THE AMENDED PLAT OWNERSHIP OF RE HAMRICK AND ANNIE B HAMRICK ACCORDING TO THE PLAT THEREOF RECORDED IN PLAT BOOK 3 PAGE 58 OF THE PUBLIC RECORDS OF OKEECHOBEE COUNTY FLORIDA THENCE S 30 DEG 19 MIN 49 SEC W ALONG SAID EASTERLY LINE A DISTANCE OF 1220.61 FEET THENCE S 67 DEG 47 MIN 29 SEC W ALONG THE EASTERLY LINE OF SAID 30 FEET WIDE STRIP OF LAND A DISTANCE OF 1164.45 FEET TO THE INTERSECTION WITH THE ARC OF A NON TANGENT CURVE IN THE AFORESAID NORTHERLY RW LINE OF STATE ROAD 15 SAID CURVE BEING CONCAVE TO THE NORTHEAST HAVING A RADIUS OF 17138.74 FEET A CENTRAL ANGLE OF 00 DEG 56 MIN 41 SEC AND BEING REFERENCED BY A CHORD BEARING OF N 59 DEG 44 MIN 19 SEC W AND CHORD DISTANCE OF 282.57 FEET THENCE NORTHWESTERLY ALONG THE ARC OF SAID CURVE A DISTANCE OF 282.58 FEET TO THE SOUTHWESTERLY CORNER OF LOT 22 AFORESAID BLOCK 3 GREAT LAKE SUBDIVISION THENCE DEPARTING SAID NORTHERLY RW LINE RUN N 31 DEG 23 MIN 17 SEC E ALONG THE WEST LINE OF SAID LOT 22 A DISTANCE OF 131.87 FEET THENCE DEPARTING SAID EAST LINE RUN N 58 DEG 36 MIN 43 SEC W A DISTANCE OF 200.00 FEET TO THE INTERSECTION WITH THE WEST LINE OF LOT 20 ALSO BEING THE EAST LINE OF LOT 19 SAID BLOCK 3 GREAT LAKE SUBDIVISION THENCE S 31 DEG 23 MIN 17 SEC W ALONG SAID WEST LINE OF LOT 20 BLOCK 3 A DISTANCE OF 150.00 FEET TO THE SOUTHWESTERLY CORNER OF SAID LOT 20 BLOCK 3 BEING A POINT ON THE AFORESAID NORTHERLY RW LINE OF STATE ROAD 15 THENCE N 58 DEG 36 MIN 43 SEC W ALONG SAID NORTHERLY RW LINE A DISTANCE OF 400.00 FEET TO THE SOUTHWESTERLY CORNER OF LOT 16 SAID BLOCK 3 GREAT LAKE SUBDIVISION THENCE N 58 DEG 36 MIN 43 SEC W CONTINUING ALONG SAID NORTHERLY RW LINE OF STATE ROAD 15 A DISTANCE OF 655.51 FEET TO THE POINT OF BEGINNING LESS AND EXCEPT CONSOLIDATED LAND CO SD AND GREAT LAKES SD PORTIONS OF LOTS 23 24 25 BLOCK 3 GREAT LAKE SD 7 PORTIONS OF LOTS 8 AND 9 BLOCK 3 CONSOLIDATED LAND CO SD DESC AS FOLLOWS BEG AT NW COR OF LOT 23 BEAR N 31 DEG 23 MIN 17 SEC ALONG NRLY EXTENSION OF W LINE OF SAID LOT 23 DIST OF 500 FT THENCE BEAR S 58 DEG 35 MIN 43 SEC E DIST OF 300 FT THENCE BEAR S 31 DEG 23 MIN 17 SEC W A DIST OF 466.44 FT TO N LINE OF A 30 FT STRIP OF LAND SHOWN IN PB 3 PG 58 THENCE BEAR S 67 DEG 47 MIN 29 SEC W ALONG SAID N LINE A DIST OF 262.03 FT TO THE NRLY RW LINE OF SR 15 SAID RW BEING A CIRCULAR ARC CONCAVE TO THE N HAVING A CENTRAL ANGLE OF 00 DEG 28 MIN 59 SEC A RADIUS OF 17138.74 FT THENCE ALONG SAID RW A DIST OF 144.53 FT TO AN INTERSECTION WITH THE W LINE OF LOT 23 THENCE BEAR N 31 DEG 23 MIN 17 SEC E ALONG SAID W LINE OF A DIST OF 180.44 FT TO POB LESS AND EXCEPT GREAT LAKE SD LOTS 16 17 18 19 22 BLOCK 3 LESS RD RW 84.39 ACRES 06 38S 36E 1-06-38-36-0A00-00020-B000 Said property being in the County of Okeechobee, State of Florida Name in which assessed: DANIEL A SCHAURER DANIEL D EASTMAN FRA MAR ENTERPRISES INC LAND VENTURES OF AMERICA LLC MICHAEL J LOCIGNO RICHARD EVANS Unless said certi cate shall be redeemed accor ding to law the property described in such certi cate shall be sold to the highest bidder at the Okeechobee County Judicial Center, Jury Assembly Room, 312 NW 3rd Street, Okeechobee, Florida 10:00 A.M. on the 23rd day of January, 2014. SUBJECT TO CURRENT TAXES SHARON ROBERTSON, CLERK OF CIRCUIT COURT Okeechobee County, Florida /s/ Robin R. Parrish Deputy Clerk NOTICE REGARDING THE AMERICANS WITH DISABILITIES ACT OF 1990; In accordance with the Americans With Disabilities Act, persons needing a special accommodation to participate in this proceeding should contact Court Administration no later that seven days prior to the proceeding at 250 NW Country Club Drive, Port St. Lucie, Florida 34986, 1.772.807.4370 within two working days of your receipt of this notice. IF YOU ARE HEARING IMPAIRED CALL 1.800.955.8771; IF YOU ARE VOICE IMPAIRED CALL 1.800.955.8770. 456291 ON 12/13,20,27/2013 1/3/2014 19 Okeechobee News December 27, 2013 ACROSS 1 Magicians bird of choice 5 Seattles Best product, slangily 9 Fall faller 13 Pub picks 14 Special Forces cap 15 Fairy tale starter 16 Strike gold 18 Give __ to: approve 19 Canadian coin nicknamed for the bird on it 20 Hand-waving or finger-pointing 22 For each 23 Mythical Egyptian riddler 25 Cornfield bird 27 Smallest prime number 28 27-Across plus one, in Italy 29 Lines of theater seats 30 Goes down in the west 32 Debatable point 36 Encouragement for a matador 37 Lane straddler 39 LAX hrs. 40 Welsh dog 42 Screwball 43 Dalai __ 44 A bit amiss 46 Milk director Van Sant 47 Oval segments 48 Guy nipping at your nose, in a holiday song 52 Inquire 53 Rand McNally references 54 Takes home from the pound 57 Yogi, for one 58 Singer of the 1961 #1 song found in the starts of 16-, 23-, 37and 48-Across 61 Can of worms, e.g. 62 Drat! 63 Brookss country music partner 64 Sources of immediate cash: Abbr. 65 Mends with thread 66 FBI personnel DOWN 1 Author Roald 2 Assortment 3 Presidents weapon 4 Station with game reports and highlights 5 Clampett patriarch 6 Onassis patriarch 7 Brink 8 Declare to be true 9 Despises 10 Boredom 11 Piece of the sky, to Chicken Little 12 Shipping giant 14 Sayonara! 17 Its roughly 21% oxygen 21 Unit of parsley 23 Tinker with 24 Franks 25 Hook nemesis, for short 26 Cylindrical caramel candy 27 General of Chinese cuisine 31 Loud call 33 Auto tune-up item 34 Camp Pendleton letters 35 LAX incoming hrs. 37 Jazz licks 38 Approves 41 Amusement park racers 43 Longtime Dodger skipper Tommy 45 Brittany brothers 48 Sluglike Star Wars crime boss 49 Persistently bothered 50 Allegation 51 Missouri river or tribe 52 Cavity fillers org. 54 Blissful sighs 55 Camping shelter 56 9-digit IDs 59 Deviate from a course 60 DJs stack By Jeff Chen (c)2011 Tribune Media Services, Inc. 11/07/11 11/07/11 ANSWER TO PREVIOUS PUZZLE: Edited by Rich Norris and Joyce Nichols Lewis xwordeditor@aol.com Crossword Puzzle ADVERTISEand Get Results www.newszap.com click on classifieds When you want something sold, advertise in the classifieds. Your new car could be in todays paper. Have you looked for it? Need a few more bucks to purchase something deer? Pick up some extra bucks when you sell your used items in the classifeids. Reading a newspaper helps you understand the world around you. No wonder newspaper readers are more successful people! 2 Serving the communities south of Lake Okeechobee May 27, 2010 21 Okeechobee News December 27, 2013 Special to the Okeechobee News/ YMSYMS Students of the WeekYearling Middle School would like to announce the students of the week for Dec. 16: Jose Cervantes, LynD Lewis, Kevin Garcia and Amber Wheeler. By Annie ChambersU.S. Army Corps of Engineers J acksonville Of ce The U.S. Army Corps of Engineers is responsible for the environmental stewardship of 456 water resources development projects located in 43 states and occupying 5.5 million surface acres, 237 navigation locks, 926 harbors, 75 hydropower projects, and 25,000 miles of inland and coastal waterways. Invasive species occur at most of these projects and include terrestrial and aquatic plants, animals and insects. Invasive species pose a serious threat, impacting wildlife and sheries habitat as well as human health and resulting in enormous cost for eradication and management efforts. The Invasive Species Leadership Team w as established to provide direction to the ongoing research program, represent the corps on regional invasive species councils and assist corps headquarters in the development of national invasive species policy and program management. The Invasive Species Leadership Team (ISLT) is an 18-member team that consists of one representative from each division of ce and a representative from one of the district of ces within each division. Headquarters proponents include representatives from within the natural resource management and navigation programs, along with a technical proponent from the U.S. Army Engineer Research and Development Center (ERDC). Jon Lane, chief of the Invasive Species Management Branch, represents Jacksonville District and South Atlantic Division as a standing member of the ISLT. "We [the team] create invasive species policy for the corps, develop program management plans and are now in the process of implementing those plans," said Mr. Lane. The new Invasive Species Community of Practice (CoP) website serves as a central repository of information and expertise on invasive species issues, from contract speci cations and equipment decontamination to the latest in outreach education, policy and guidance. The corps adapts its management plan and policy from the National Invasive Species Council, which creates the National Invasive Species Management Plan. "It is important that policy is implemented consistently throughout the corps," said Mr. Lane. Corps of Engineers battles invasive species Special to the Okeechobee News/ ACOEHarvesting water hyacinth on the St. Johns River. Special to the Okeechobee News/ ACOEWater lettuce and hyacinth block the Okeechobee Waterway. Special to the Okeechobee News/ ACOESeeds and plants germinating on mowing equipment on a Dredged Material Management Area (DMMA). The mowing equipment moves from DMMA to DMMA, potentially spreading invasives if not removed. 2 Serving the communities south of Lake Okeechobee May 27, 2010 23 Okeechobee News December 27, 2013 By Charles M. MurphyOkeechobee NewsCory Vickers was named Most Outstanding Player and four other senior football players took home team awards at the annual Okeechobee High School football awards banquet held Tuesday night at OHS. Tyler Smith won the Most Improved Player A ward. Cody Walker took home the Golden Helmet Award. Adrian Minondo was named Offensive Most Valuable Player, and Khalil Smith received the Brahman Award. Freshman Antywyn Fludd was named the Defensive Most Valuable Player this year. The coaching staff honored 14 seniors w ho graduate this year. Coach Chris Branham described them as a ne group of young men of whom he was extremely proud. He helped coach ve of them last Saturday at the South Central Florida All Star Football Classic in Sebring. Okeechobee was on the winning side 12-7. Adrian Minondo was named the MVP for the Central offense as he rushed for just under 100 yards in the game. Vickers and W alker teamed up on defense with a forced fumble by Vickers and the recovery by Walker that saved the game on the nal play. The Central team consisted of players from Polk and Highlands County. Walker was also named to represent Okeechobee in the Florida Athletic Coaches A ssociation all district team. He will play in the Treasure Coast versus Brevard County All Star game on Jan. 17, 2014. Walker said winning the Golden Helmet A ward was a new experience and de nitely an honor. He said it felt good to know that his coaches and peers felt highly of him as a player and as a person. Walker holds out hope he could play college football next year. He said he really enjoyed playing in the all-star game in Sebring. "It was awesome. It was very nice to show off our talents to new fans, and to compete with players above and beyond our skill level." Walker also said he is very excited to play in the Brevard All-Star game in January because it allows him to put on the purple and gold of the Brahmans one last time. Vickers said the Most Outstanding Player Award tells him that all of his hard work has paid off. He thanked the coaching staffs from Myron Jackson to Coach Branham and also thanked fellow seniors like Walker, Bobby Jo Garza and Jefferson Davis for pushing him. Vickers was praised for his high energy and great attitude and work ethic this year. "There is never a reason to keep our heads down. We kept ghting all year. It's like a dog ght and we de nitely didn't go down, we just ran out of time," he added. He also enjoyed the all-star game last weekend and noted there was a great crowd, great enthusiasm, great atmosphere and great competition on the eld. He advised future Brahmans to always be dedicated because that leads to enthusiasm and wanting to get better. He explained that wanting to get better makes you better and leads to better results. He intends to study at Ava Maria University and play football next fall. He would like to become a Wildlife Of cer for the Fish and Wildlife Commission. Tyler Smith said he enjoyed the Most Improved Player Award because it shows that he put a lot of hard work into the game. He said he caught the eye of Coach Branham during weight training and was encouraged to try out for the team. He said the coaches like Chaka Smith really worked with him to improve. "It was my last year in high school so I said why not give it a try. The coaches stuck with me and helped me. I'm real proud of myself," he added. Smith said he would like to attend college and become a teacher. Fludd said he was disappointed that a leg injury cost him half the season this year. Still he was a factor on defense in the secondary. He still has three years left in high school. He is keeping active in the offseason with conditioning and also with basketball. He said the injury really hurt him because it occurred just when he had started to make big impacts. "I hate I had that injury because I could have improved even more if I had played the whole season. I'll just try to be myself, not get too con dent and lead the program over the next few years," he added. Khalil Smith said it was hard for him to explain what the Brahman Award meant to him. He has been around the team for 12 seasons, starting out as a ball boy. He called the award amazing. He praised his coaches for keeping him motivated and noted he will always remember a four-touchdown game he had against Fort Pierce Westwood, the Brahmans lone victory this year. "I had to play like a Brahman. I have to thank my coaches for pushing me. I also thank my offensive linemen for helping me through," he added. Minondo said he enjoyed winning the MVP for the Brahman offense and the MVP for the All-Star game. He said he worked hard all year and tried to run the ball and did his best in the all-star game. "It was one of the hardest hitting games I've ever been in. They tested me for sure and the players were hitting pretty good out there," he explained. Minondo would like to play college football. He said he wants to be remembered as one of the better backs in OHS history. He was one of only four running backs who have rushed for over 1,000 yards in a season in the past 20 years. Minondo suffered an ankle injury that cost him a few games but he still excelled as a running back. He didn't mind all the pain and having to ice his ankle every night. His advice to younger football players is to stay healthy and be dedicated and determined to excel. "Try to stay healthy and keep grinding, just do what you can do and don't get into any foolish accidents," he added. JV Coach Joe Smith honored the members of his successful team this year. The Offensive MVP this year was Jacob Emmick, and the Defensive MVP was Tristen Anderson. Wyatt Bessenbacher was named the Team's Most Valuable Player. Anderson said it felt good to win the award. He said the JV team consisted of a dynamic class of players that should one da y improve the varsity team, "Everybody bonded together. At rst we played for ourselves. Once we realized what it felt to play as a unit, we improved." Emmick said he was surprised to win the award. He noted the coaches told them once they tasted victory they would love it and that would motivate them. "When we won we tried to keep it going. The team work was amazing this year," he said. Emmick said he feels the group will stic k with the sport and together can make a deep and talented varsity squad in the next fe w years. He expects to be a major contributor as a receiver and running back next year. Okeechobee High School football team honored at banquet Okeechobee News/ Charles MurphyTyler Smith was named the Most Improved Player for Brahman football by coach Chaka Smith. Okeechobee News/ Charles MurphyAdrian Minondo earned the Offensive Most Valuable Player Award as he rushed for over 1,200 yards as a senior. Okeechobee News/ Charles MurphyCory Vickers was all smiles as he received the Most Outstanding Player Award from Brahman head coach Chris Branham Tuesday. Okeechobee News/ Charles MurphyAntywyn Fludd took home the Defensive MVP Award. Also in photo is Defensive coordinator and assistant head coach Tyrone Smith. Okeechobee News/ Charles MurphyCody Walker received the Golden Helmet Award from assistant coach Chris Hall.